In the first days after heavy floods hit Serbia, the Serbian police interrogated a group of citizens accusing them of "spreading panic" on their Facebook and Twitter profiles. Allegedly, they upset the Serbian nation by writing about "the hundreds and thousands of corpses floating in Obrenovac," a suburban part of Belgrade that was completely destroyed by the wild waters. In contrast, the Serbian Government claimed that no more than 33 people had died in the floods. Quoting forensic reports they found that "only" 13 of the victims died of drowning while the rest died by natural death but did not clarify what was that natural cause. The way Serbian Prime Minister, Aleksandar Vucic, confronted this contradictory information was reminiscent of Milosevic's despotism which began in a similar manner. Censorship was an introduction into his bloody era. Vucic does not manifest such extreme political pathology, but the first symptoms are diagnosable. Interrogating citizens on charges of, "spreading panic" is a well-known methodology in the early stages of a latent dictatorship helping it test the reaction of its behavior in local and international communities. The Vucic political clan obviously used these interrogations as a method of intimidation. He showed an enormous interest in controlling social networks primarily because they are the strongest front of people's revolt and resistance in a time when the official Serbian media are under his thumb. Having managed to impose self-censorship on them, he also transformed them into billboards of rich and famous donators. Online discussion regarding the number of dead confirms the fact that Serbian citizens were left to search for the truth by themselves. The government kept the silence about the victims and citizens had no other choice than to "spread information" on social media. In such circumstances Twitter and Facebook became an independent media oasis. It helped not only for spreading vital information, but also in rescuing of over 1500 people who would have remained trapped in their flooded homes without "tweeting" and "retweeting." 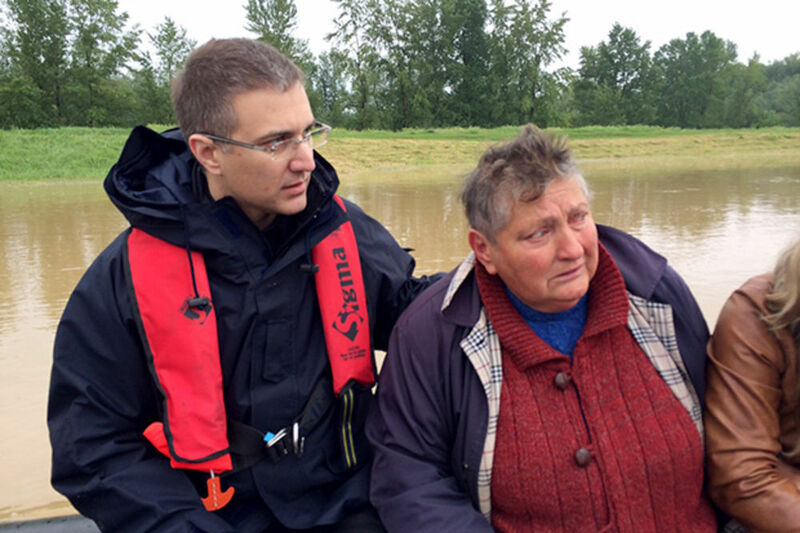 At the same time Vucic's politicians, wearing safety gear and sitting in boats, posed for reporters sailing through flooded Obrenovac which is being called the Balkan's New Orleans. Using two Twitter hash tags, #ulicecenzuri and #zatvorup Serbs spoke out about censorship during the flood. The First Man of Serbia and his party are powerless to stop this river of online protest. On the other hand, some of his most loyal and influential supporters employed in the censored media as well as in the censored Serbian Church intentionally launched an irrational and ridiculous thesis that bordered on paranoia. But none of them were interrogated in police. Serbian Patriarch Iriney blamed the Serbia gay community for the floods seeing them as God's wrath due to upcoming gay pride celebrations. Bishop Amfilohije, a proven homophobic, went a step further concluding that Austrian drag queen Conchita Wurst could be responsible for the Balkan natural disaster. He said that the Balkans was punished for celebrating Conchita's Eurosong triumph. At the same time, this "biblical meteorologist" as "Bild" called him, was deeply and masochistically grateful for the suffering of the Serbian people finding it as an evidence of Jesus' love. "Internet's Censors" ignored both, "spreading of the panic" and hatred toward the LGBT population. In addition, Vucic's "anti-panic cyber team" was not worried about HAARP conspiracy theory. Serbian police and prosecutors overlooked the Facebook group "Let's move the HAARP from Serbian land" which has more than 47000 online supporters. Waves of anti-Western hatred warmed by the theory that an American military experiment over Serbia caused floods did not upset Serbian officials even though Western countries sent rescue teams and money to fix the tragic consequence of Serbian political irresponsibility. The Serbian PM wants the Serbian nation to believe in irrational dogmas as they could not rationally insist on political responsibility of the Government. But he cannot avoid it. There is no excuse that none of them had known of the upcoming disaster. Simply, it is impossible. Three days before the disaster even an Italian insurance company informed their Serbian clients about upcoming squall weather and " torrential floods". If Vucic had collaborated more with meteorologists and scientists than the church dogmatists, maybe these of 33 people would still be alive. In era of modern technology and satellites, Vucic tries to control situation by media censorship and religious conspiracy theories. However, when these are lacking he resorts to war against online "dissenters." Many of the blog sites were hacked. Serbian newspaper editor Srdjan Skoro was the first victim of Vucic's censorship a few days before the floods. Having said that "the new Government has no system or institutions for defense of natural disaster" he lost his editor's position. The journalist of "Radio-S", also a citizen of Obrenovac, was warned " to be carefully what she is saying on TV". Using the days for mourning as an excuse, Serbian leader ordered the temporary suspension of certain international TV channels further restricting the independent media space in Serbia. Vucic is a potentially dangerous man. During these turbulent days, he has shown that he is willing to push the panic button and would rather seek counsel from conspiracy than science. Vucic is heading on a course that could continue towards the political suicide of the Serbian nation that had already been seen in Milosevic's era. He dreamt about luxurious "Belgrade on the water", but all the citizens got is Serbia under water. People are dead, houses and cars are destroyed but Vucic got a boost: his dictatorship did not sink. Rather, it has surfaced.